I'm on my way to Phoenix, Arizona. I'll spend a few days there enjoying the sights and seeing what it's like to be in a desert town when it's almost winter. Hawaiian Airlines flew me. The ride was short and smooth. The best part was the meal----it was free and tasty! 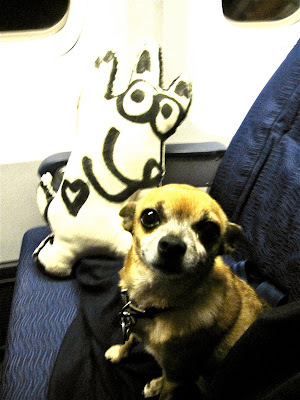 Akamai and I became friends on the flight. 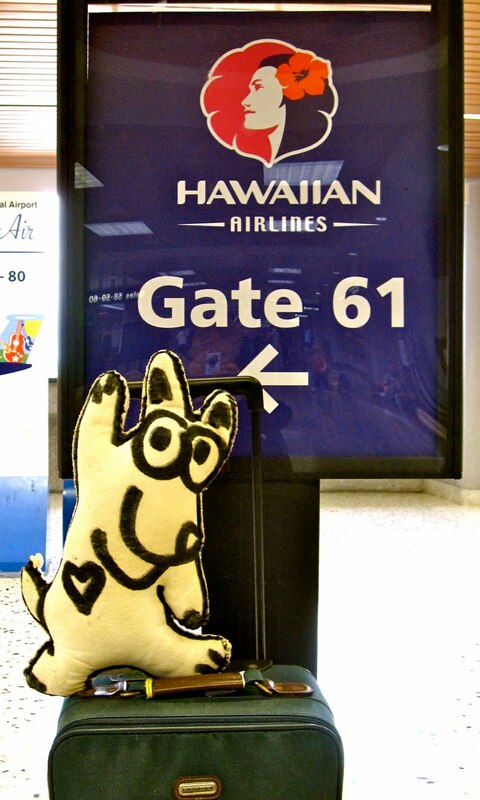 This little pooch gets to travel back and forth from Maui to Phoenix with his owner, Kay, all the time. She has a home in each place so he's always on the move! Phoenix is a big city in Arizona, but there are many smaller towns surrounding it like Tempe, Mesa, and Scottsdale. 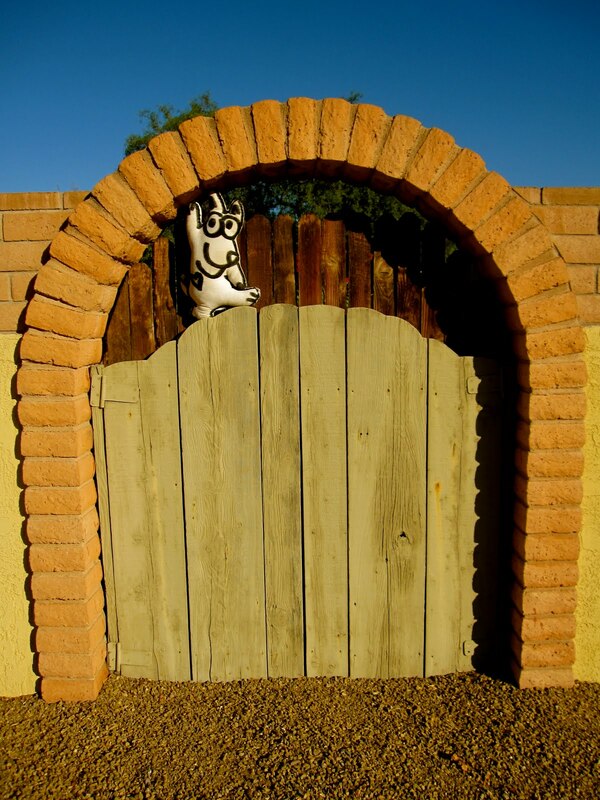 Here I am in Scottsdale checking out the scenery. There are lots of arches around this town because of the Spanish influence in this southwestern corner of the United States. I stopped by Fire House 601. I made a new firefighter friend, Jon, who showed me around the station. Look at the photo above to see the engineer's panel inside the truck. All those switches control the hose and everything else on the fire engine. Yikes, that's a lot of dials and switches to figure out. Mom propped me up against this cactus plant and guess what? I had teeny, tiny spines in my head that had to bed plucked out. Yikes!! I'd better be more careful where I'm put! Would You Like to Buy a Classic? I stopped by "A Lot 2 Offer" to ask directions as I was walking around Scottsdale and spied this beautiful, shiny red Ford in the window of the showroom. It's a 1932 Tudor sedan. Look closely at the Arizona license plate------notice the cactus. This is definitely desert country. Mom is always dragging me to second hand stores. 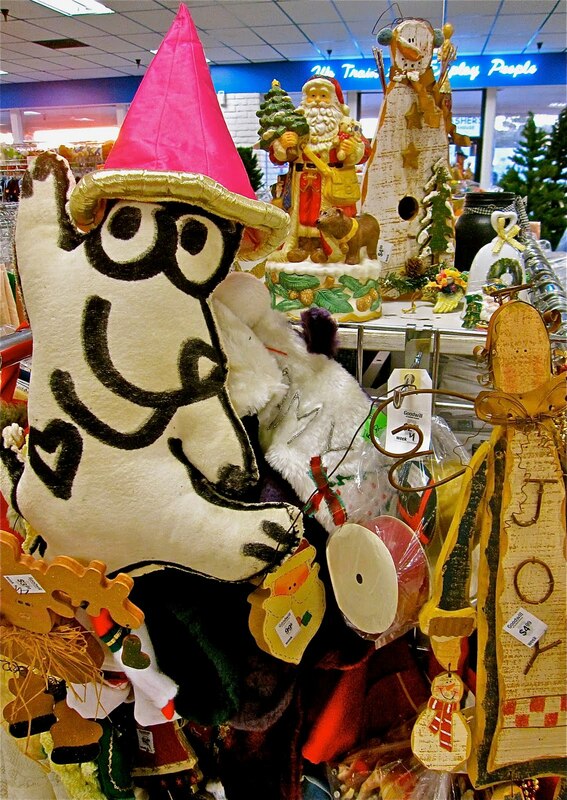 She knows how to get a good bargain as she's been doing "recycle shopping" since her college days. What do you think of the hat? Is it me? Could I be one of Santa's little helpers? Yes, Mom knows how to find the best bargains anywhere. Look where we ended up after a three-mile walk! Perfect! This is a Goodwill Store in Scottsdale at Scottsdale Road and Oak. Just google "Goodwill" for a store near you. Remember: Reduce, Reuse, and Recycle! It's good for you and good for the planet. 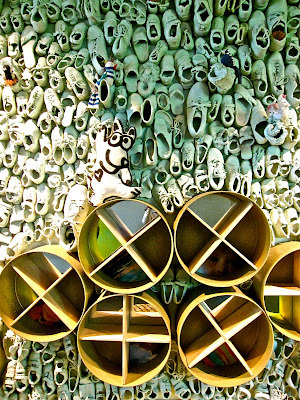 Now, you know in Hawaii, when you enter a home, you leave your shoes outside. It's a custom brought to the islands from Japan. 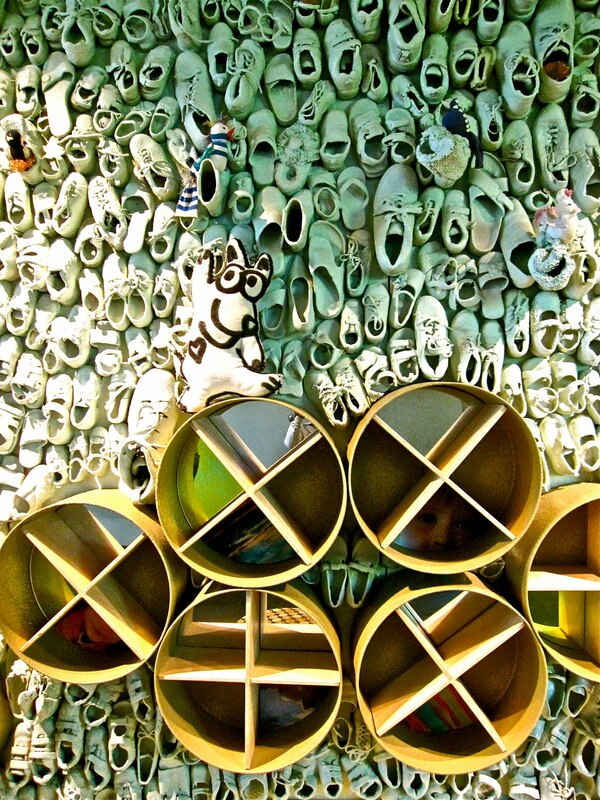 So......isn't this a good way to keep the shoes from piling up on the porch? 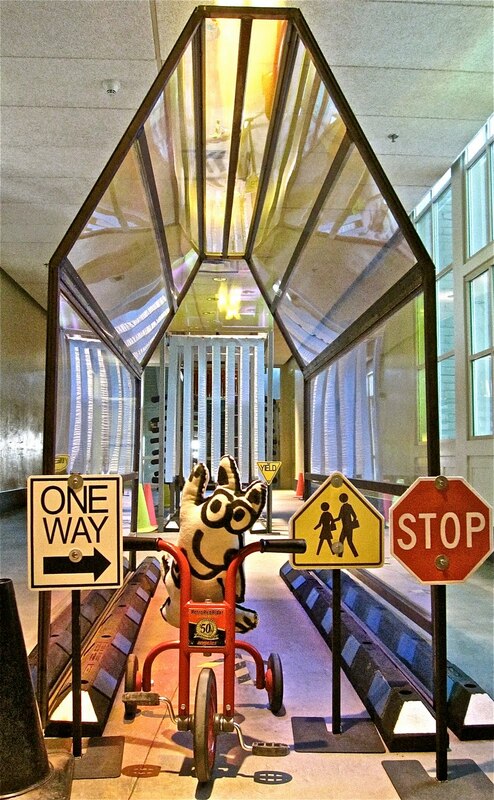 Sarah Marie took me to the Children's Museum of Phoenix and, boy, did we have fun! I'm in the art studio for children. There were kids making turkeys and doing decoupage. 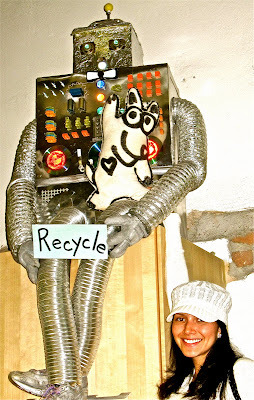 This is a robot created out of recycled materials. I couldn't see which way I was going in here! 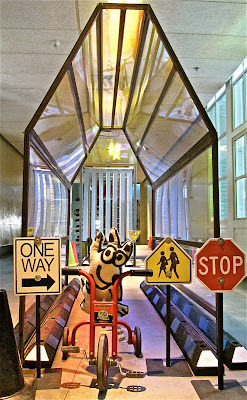 There were little kids running through this maze-like soft sculpture shrieking and laughing their heads off! 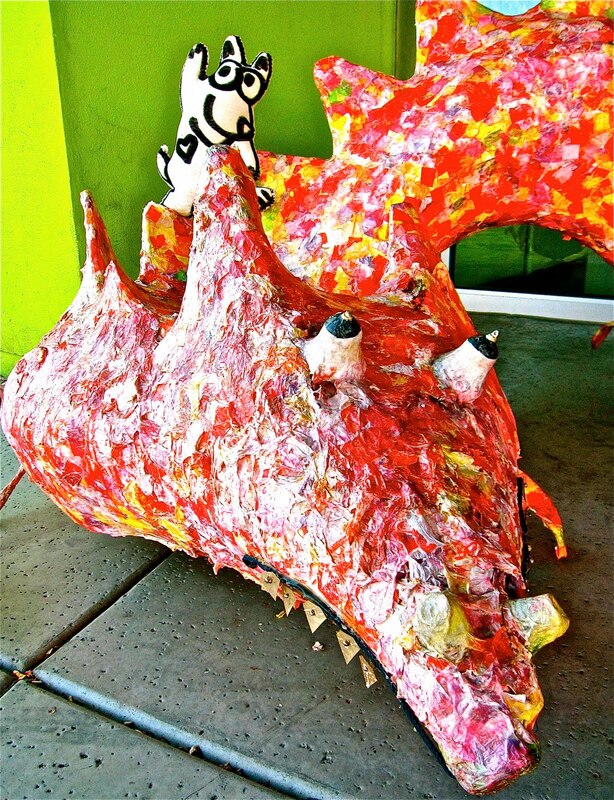 As I entered the Children's Museum of Phoenix, this very pinkish-red dragon made of papier mache welcomed me. I loved his smile and shiny teeth that shimmered and danced in the wind. This was fun. I rode my trike through the "car wash" and got it very clean, and me too! This was a very nifty xylophone made from old wrenches. Isn't it clever? It's sounded beautiful when played. I bet your dad could put one of these together for you, or maybe mom. 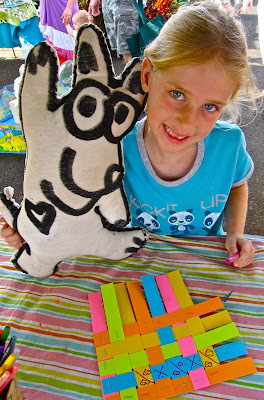 Making puppets is one of my favorite things to do. Sarah Marie and I had fun on stage with this construction worker! 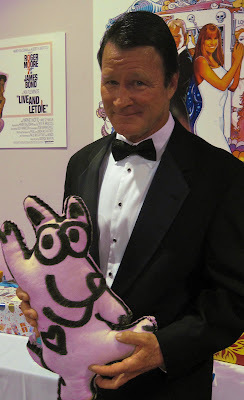 Why don't you google, "puppets", make a few, write a little play, and then have a show for your friends? You could build a stage out of an old cardboard box or just turn a table over. I know you'd have fun! Alex, the manager of the gift shop at the Children's Museum of Phoenix, bade me farewell and encouraged me to return. I know I will. I had such an enriching and fun time there enjoying all the activities and stations set up for young people. Thanks to Sarah Marie for taking me! Tom Servais and Brian Beilmann (with me on his head) are two of the top surfing photographers in the world. Here they are in downtown Honolulu taking shots outside of the newly renovated Hawaii Theater. It's a BIG night----the premier of Jack Johnson's documentary--EN CONCERT. The movie follows Jack's world tour last summer. Jacque (holding me) and Jen were at the reception for the premier! There were yummy "pupus", that's appetizers in Hawaiian, made by Ed Kenney of the restaurant, Town. Jacque is wearing the hat because she was selling raffle tickets. The display behind them shows photographs of the good work that the Kokua Hawaii Foundation does. That's Jack's non-profit which teaches children to grow gardens and eat right! Shall I buy one of Jack's t-shirts? I'll ponder that decision. 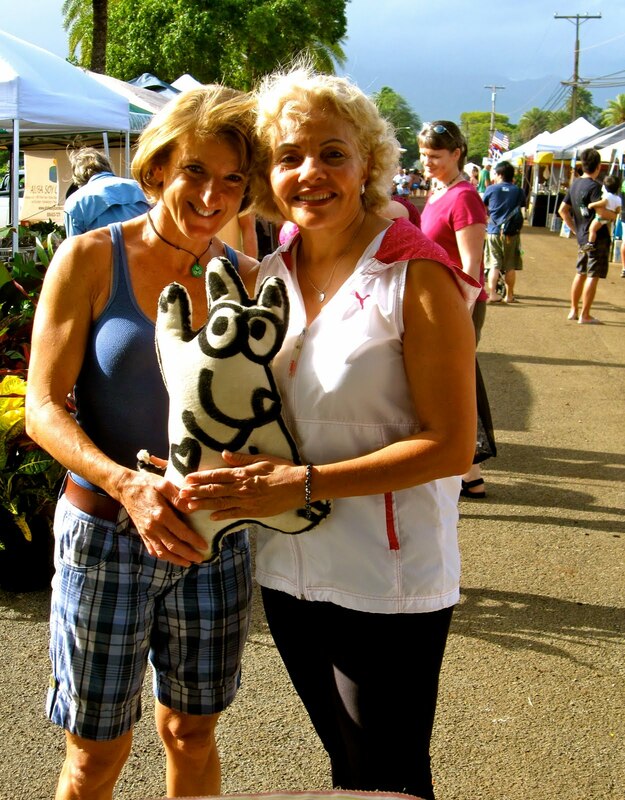 I love the design of the ones MaryJo (the blonde) and Yvonne are wearing, but I think my little doggie body is too small to fit! What do you think? Oh boy, what a treat it is for me to be in this beautiful theater. Just look at all the details. The documentary was wonderful. I loved seeing young people in Europe from France, Germany, England, and the Netherlands watching Jack perform. The audiences had adoration on their faces as they swayed to his music and blissfully beamed back his "theme of love." Look at the trailers on YouTube! Wow! I'm at the Saturday morning KCC Farmers' Market sitting in the lap of one of Hawaii's most famous and innovative slack key guitarists--Makana. 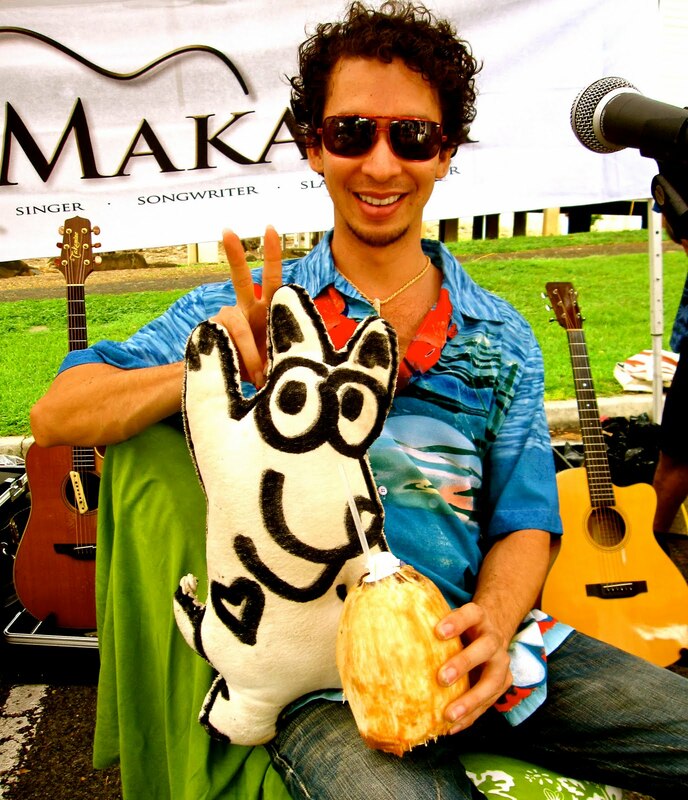 He has performed everywhere and his audiences love his traditional slack key fused with contemporary style. Check him out on YouTube. His message of love is evident. He plays from the heart. 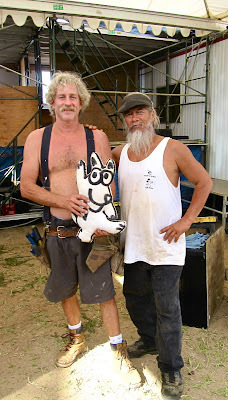 Risse' s husband, Tui, live on Oahu and sell the organic tomatoes that the rest of the family grow in hothouses in Waimea. The tomatoes are quickly shipped over on the Young Brothers barge ready for market! Daisy, the blonde, and I made friends right away. 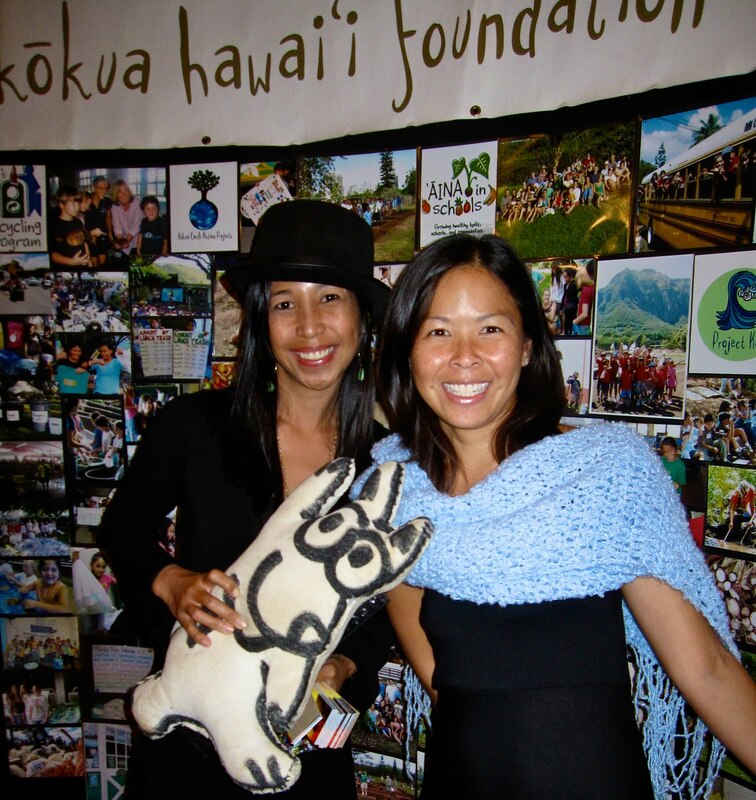 She's an athlete in training for the Honolulu Marathon on December 12. She also trains and coaches members of the Leukemia and Lymphoma Society for the long run---a little more than 26 miles! Yikes! I'm sure she's training hard! That's her friend from Italy, Stefy, keeping her company. Wally Amos was a hit at the Haleiwa Farmers' Market and drew a really big crowd. Lots of people took their picture with him. 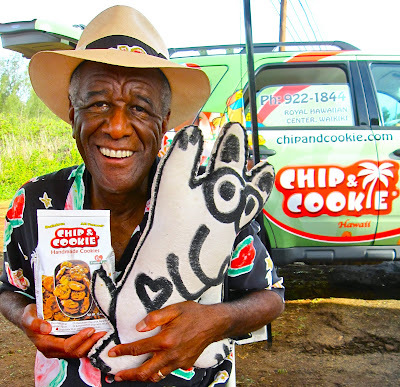 He was promoting his new company, "Chip and Cookie" as he sold his "Famous Amos" cookie to Kellogg's several years ago. See his car in the background. Email him and buy a bag of his cookies online. Get ready for a treat, they are very tasty, especially the butterscotch! Trying Out a "Chip and Cookie"
Joel and Polly stopped by and chatted with Wally for a little while and sampled the new cookies! YUMMMMMMMMM! Every Sunday morning I'm at the the Haleiwa Farmers' Market at the Keiki Korner ready to do a craft project with children. Gordon and Carrie came by for a chat as they cruised the market. 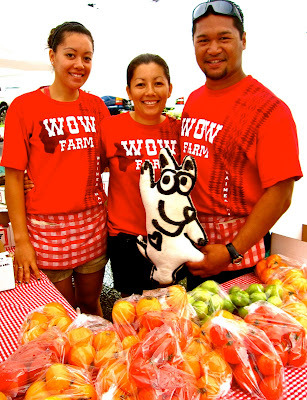 There are so many vendors selling fresh produce, food, plants, orchids, handcrafted items and so much more. You can even get a massage! Stop by. It's open from nine to one. Amanda is a first grader at Waialua Elementary. She dropped in to do a craft with me (and Mom) last Sunday. 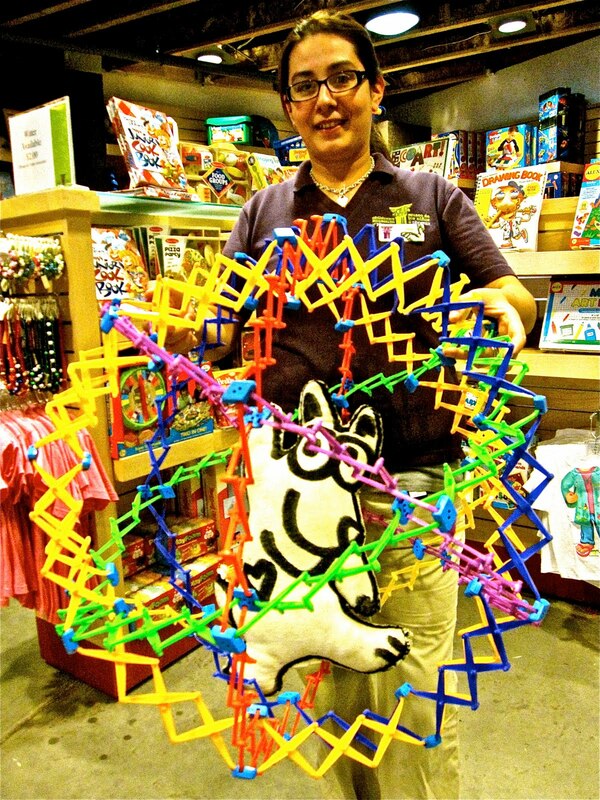 Look at her beautiful weaving! I was very impressed with the colors she chose and the carefully executed designs she made on her piece of art. Bravo Amanda! The Triple Crown of Surfing is Setting Up!! I'm getting very excited! The last three contests of the world surfing tour are about to commence at Ali'i Beach Park in Haleiwa. Marty Thomas, Managing Director of the Triple Crown, is standing on lumber and in front of scaffolding that will be used to erect bleachers at the competition. There will be reporters, photographers, and media people from all over the world attending this big contest. Marty was 9th in the world years ago when he was a professional surfer on the ASP (Association of Surfing Professionals) circuit. Robert North is the Production and Construction Manager of the Triple Crown. That's a mighty big job and he's been doing it for 26 years! Randy Rarick, the Executive Director, employs 75 people to put on the contest and they are all "locals". Did you notice the flags? Can you tell me to which country each one belongs? hooked in. This year's contest will have its own t.v. channel. Go to Oceanic Cable Channel 250 and see what's happening! She's a Good Mom. She Surfs! 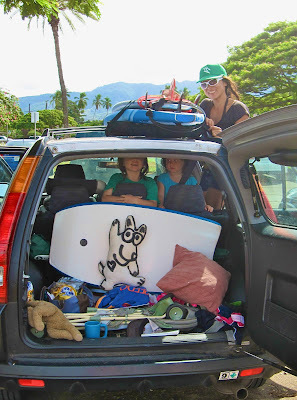 Kimiyo is strapping surfboards to the top of her car after taking her girls for a surf. She rides waves and loves the sport and I am sure her daughters are loving it too. They surf Ali'i Beach Park all the time. "It's perfect for little kids", she says, "and everybody's there." That's Aiko on the left and Hanako wondering what her sister is up to! The Triple Crown of Surfing is Coming!! I'm in the lobby of the Turtle Bay Resort! 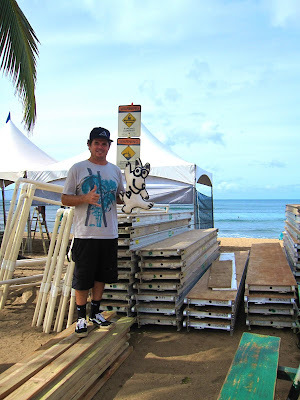 Jody, of Ocean Promotions, and her crew put up deluxe bulletin boards with photos, stories, and a pair of shoes to herald in the biggest surfing event of the year, every year! Look closely above my head to the left--you'll see the the Father of Surfing", Duke Kahanamoku, and the Triple Crown's founder, Fred Hemmings. 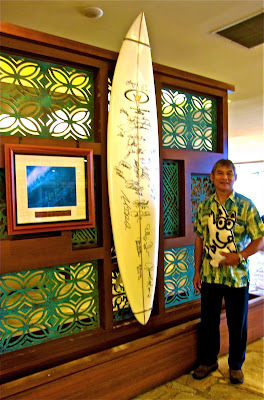 Roger has been a bellman at the Turtle Bay Resort for 37 years! He's Mom's old friend from when she worked on the front desk 35 years ago. They go way back!! Isn't that a fine surfboard next to him. It looks dirty and smeared, but that's just the signatures of surfing's top guns. Click on the photo for a close-up! Director of the most famous surfing contest in the world, The Triple Crown, Randy has been an icon in my neighborhood forever. He's also been an involved community member. He had a big party at Waimea Falls last night to celebrate his birthday. Everyone had to dress up as a character from a James Bond movie! It was lots of fun and the music was great! That's Randy's wife, Jacque, in the poster behind him.